We know, we know…the holidays can be a big, giant, overwhelming, horrible stress ball of ickiness that can leave you wanting to cancel the next two months and just binge on Netflix and pumpkin lattes. Or… they can be totally awesome! We are not naive enough to think there aren't a few things that may be out of your control which can negatively affect your holiday experiences, but there are LOTS of things you can do to make sure negative experiences and icky obstacles are few and far between during your holiday season . 1. Plan ahead and put ideas and events on paper! From meals and outings to entertainment and special events, the holidays are full of good fun. Planning ahead and having a clear calendar of events for the whole family to see is a great idea. For example, when you’re planning meals over the holiday season, especially larger meals, make sure to create a complete list of items you’ll need at the store. Create your menu and prep for your meals far ahead of time so that there are minimal surprises when the time comes for cookin’. And for outings such as school plays, holiday shopping and the multiple performances of the Nutcracker, make sure to write them all down with specific information - even links when available. That way you’ve got everything in one place when it’s time to move and groove. 2. Finding time to exercising is imperative during stressful & busy times. It may sound ridiculous to add another thing to your to-do list each day, but trust us - the endorphins and other happy hormones a good workout creates are much needed this time of year. Not to mention the energy that a get-up-and-move session can give you to push through your day successfully and with minimal 2PM crashes. And keep in mind, a workout doesn’t have to include a 5 mile run and hefty weight lifting session followed by a 40 oz protein drink while flexing and growling at yourself in the mirror. Stretching, cycling, walking and hiking are perfect ways to get moving while supporting a healthy mind and body. 3. This one will probably be everybody’s favorite little piece of advice. Take a nap! That’s right - taking a nap regularly helps you to reenergize and gives you a much needed break from the hustle and bustle of every day holiday nuttiness. If you’re not into napping (WHAT!?) find a comfy place to lie down and read a book, or head to a quiet room in your house or at the office and meditate for 15 minutes. Taking quality time for yourself, where you’re focusing on yourself in a positive, producing way helps on multiple levels. OHMMMM! 4. Expectations are always a bit - OK - maybe massively escalated this time of year. You want to have the perfect dinner, find the perfect gifts , have the perfect experience with family, etc. The secret to not being disappointed during the holidays is to not expect too much! Keep everything on a realistic, just-another-day level of expectations. If you have an Uncle Phil who is a gassy loudmouth every year at dinner, don’t expect him to change from year to year. Just make adjustments for his behavior, like asking him what his favorite movie or sporting event is, then put it on for him when he arrives - Hooray! - suddenly hours of peace and tranquility are yours and Uncle Phil is happy and can fart all he wants in the living room. Don’t set yourself up for disappointment. Having realistic expectations of yourself and the people you love will help keep you and them grounded and happier. 5. This may be almost as good as napping! One of the most important pieces of advice we can give is to stay in the holiday spirit by focusing on the positive things that happen every day. A great way to do this is to start a holiday gratitude journal. Write down everything that you’re grateful for each day starting the week before Thanksgiving. Keep your journal positive! Only good things can go in there. It’s not a diary where you talk about your whole day, you’re just inputting the best stuff that happened that day. Staying positive and keeping a grateful attitude every day will go a really long way. 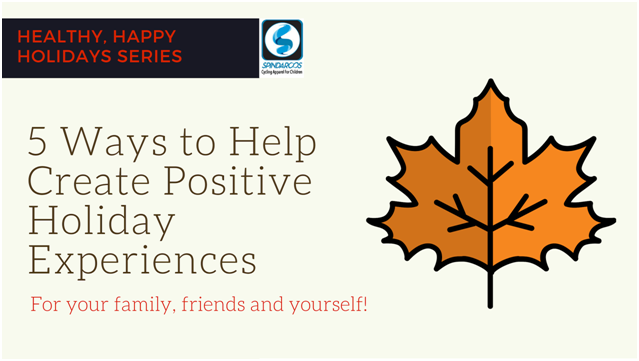 These are just a few ways to rock it through the holidays with a positive, proactive and peaceful attitude. Encourage your family to do the same, that way everyone is on the same page and you’re all working together to create the best holiday experience!